The opportunity for research as an undergraduate is perhaps the most important reason for coming to Wake Forest to major in physics. 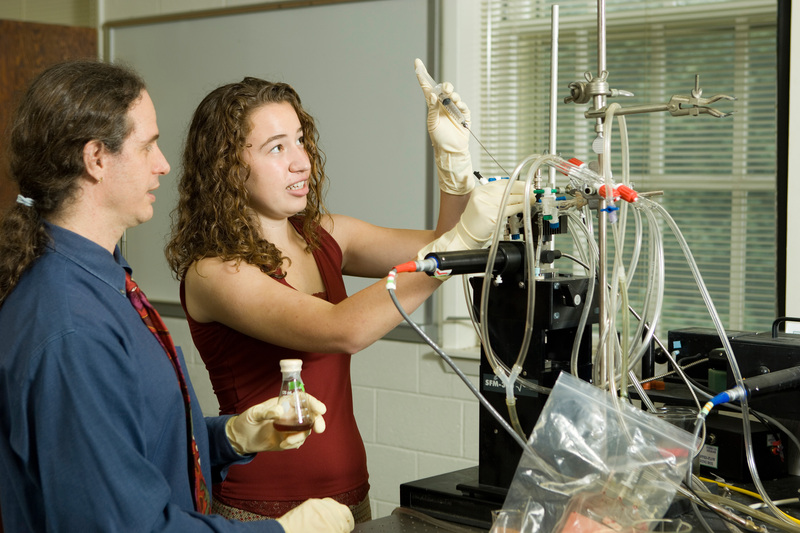 Many small colleges value close interaction between students and faculty, while research universities offer the facilities, infrastructure, support, and scholars necessary for research in the sciences. 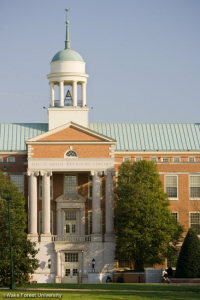 Wake Forest offers the nearly unique combination of research opportunities and a faculty that values close work with undergraduates. Research is completely different from the labs you take associated with courses. In instructional labs, you often know what the answer is supposed to be. Much research begins by finding a good question, but at the start, you may not even know what the question is. In the Wake Forest Physics Department, research opportunities are available in biophysics, nanotechnology and molecular motors, condensed matter physics, gravitation and particle, and optical and laser physics. Opportunities in experimental, computational, and theoretical physics are found in each of these subject areas. Undergraduate students can do honors theses or perform undergraduate research in any of these areas. Please visit the Undergraduate Honors Research Topics page for past graduates and their research topics and our Profiles page to see various research activities in which our current students are involved. In research, you will learn new ways of analyzing information, of solving problems, of working as a member of a team. It is exciting, challenging, demanding, occassionally frustrating, but alway stimulating. You will form relationships with faculty and other students that you will treasure the rest of your life. Undergraduate research experience will help you get the graduate or medical school admission (or job offer!) that you are working for. Your strongest letter of recommendation will come from your research advisor, simply because this mentor will know you better than any professors who have just taught you in class. You can get course credit for research. Alternatively, you may be able to get paid. 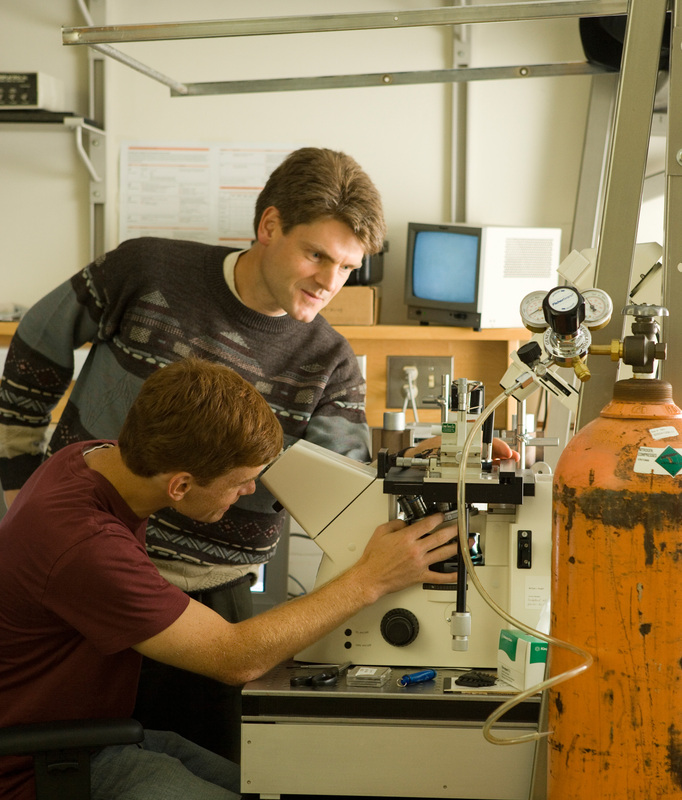 Many faculty have grants, and the university offers summer research fellowships. All our faculty welcome undergraduates in their research. Physics 381-382 are research courses in which the student has an opportunity to work on an individual basis with a professor. In most cases the student joins an ongoing research project where he/she has a unique opportunity to: 1) do physics and to experience the thrill associated with searching for a better understanding of our universe; and 2) to work with physicists, to see what they do, and to observe how they go about their research work. 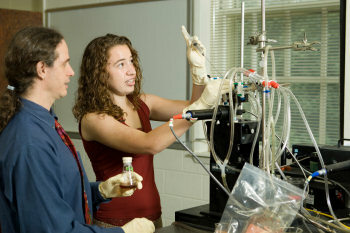 Activities in these research courses may involve computer searches of the literature, conferences with professors and students, computer computations, and work in the laboratory with the most modern instruments. All majors are strongly urged to take advantage of this opportunity and experienc e undergraduate research by taking research courses. Of all our courses, research courses are often the most rewarding. 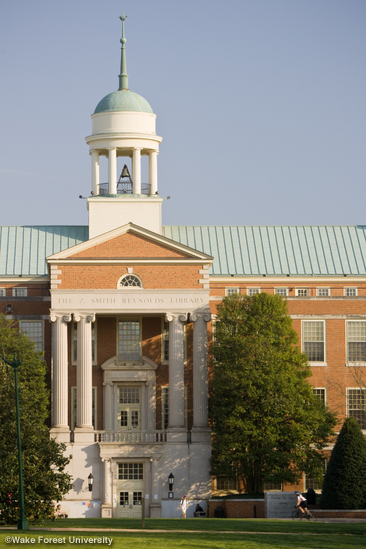 Research options are described under the Research menu item, which can be accessed from the main menu in the WFU physics home page, or from this link. 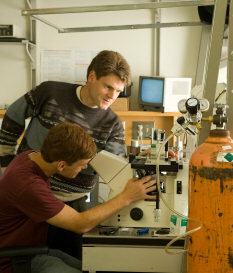 The Physics Department offers a wealth of state-of-the-art research facilities. Visit our Research Facilities page. Undergraduate students research a wide variety of topics. Visit our Honors Research Topics page to see undergraduate student names and topics organized by year. The Graduate School provides opportunities for advanced study in a number of focus areas in the Biomedical Sciences. These opportunities are accessed by undergraduates, graduate students, postdoctoral fellows and physicians. The Graduate School Office on the Bowman Gray campus now provides on-boarding policy for undergraduate students in good standing for research experiences or enrollment in graduate level courses as "unclassified" students. For more information, see the article on Undergraduate Enrollment Policy in Biomedical Sciences. The Wake Forest Research Fellowship Program is sponsored by the Dean of the College of Arts and Sciences and is designed to encourage individual Wake Forest undergraduates to join their professors as junior partners on scholarly research projects. While improving opportunities for mentoring and helping students to progress into advanced work, these are also a means of supporting successful and dedicated students with financial scholarships. Up to 55 competitive, merit-based fellowships will financially assist students who collaborate with faculty mentors. For more details, follow the link to this program's web page. We have a large collection of physics books and journals in the Z. Smith Reynolds Library. There you will find many books on any homework subject. When you do research you may use the current research journals housed on the third floor of Olin, or the online editions of journals available through the library web page. At times the appropriate instrument for a particular experiment cannot be purchased and must be designed and made by the researcher. Metal components can be made in our machine shop. Physics majors are encouraged to take the non-credit machine shop course offered by our machinist. Last year the course consisted of 12 lessons each term on Friday afternoons. When the student's machine shop skills reach a satisfactory level he/she will be given permission to use the shop without supervision.